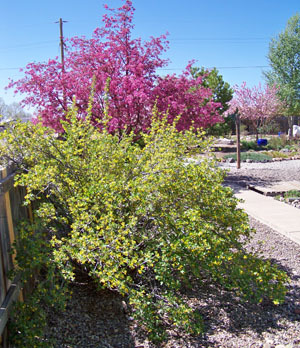 Comments: Locally called Rocky Mountain Currant. I don't know the official name. This shrub commonly grows around here; I just transplanted mine from the property I purchased. I love the currant relish I make from this. In spring green leaves with yellow flowers; in fall, redish foliage. Seen here next to Robinson crab apple. CO/NM native? yes Native to: Colorado and ? Known Locations: Many around Alamosa. Look for the beautiful yellow flowers in spring and dark red fruit in fall. I have several in my Alamosa garden.